The distinctive Sinclair Executive hit the headlines when it was launched in 1972 since, for that time, it was incredibly thin and could easily fit in a shirt pocket without distorting it. Nothing quite like it had been seen before. The Sinclair Executive was followed by the enhanced Sinclair Executive Memory. Important note: the Sinclair Executive was a very innovative calculator and employed several novel techniques in order to reduce the thickness of the casing to the minimum that was then possible. In the light of experience of some of its shortcomings and with developments in electronics, the design was improved in several different versions over the year or two after its launch. These versions are poorly documented, and so this page is subject to change as further details become available. The information below is believed to be correct, but please get in touch if you can provide further information or correct any mistakes. The Sinclair Executive was made in two types; the earlier type with 'casing & keyboard type 1' and the later type with 'casing & keyboard type 2'. The first "slimline" calculator, only 9 mm (0.4") thick. The first calculator powered by button cells. The first of the line of innovative Sinclair calculators. Casing & keyboard type 1 (with the "K" constant switch) is the original version, though had several changes in the electronics within (see below). Casing keyboard type 2 (with the "L"/"H" low/high brightness switch) is the later version. 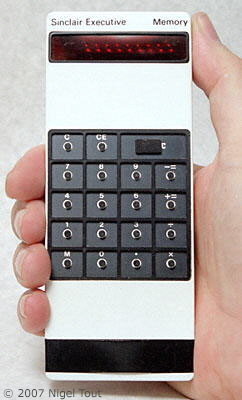 The incredibly small thickness for this stage in calculator development was attained by using "calculator-on-a-chip" electronics, button cells as the power source, a minimalist keypad where tiny buttons press sprung copper alloy fingers onto the circuit board, and tiny slide switches which use contacts on the circuit board. 56 mm x 138 mm x 9 mm (2.2" x 5.5" x 0.4"). For more information see the Evolution of the Sinclair Executive section and photographs below. Integrated circuit is Texas Instruments TMS1802 operating in a pulse mode (see "Evolution of the Sinclair Executive" below), large LED digits, and reportedly uses 3 button cells. Note: Contemporary journals of 1972 report the chip simply as the 1802 or standard 1802. Chris Curry in an interview on Youtube says that it was TMS1802 chips that he brought back from Texas Instruments in the U.S.A. which led to the development of the Executive. He reiterates this on the website "Sinclair Radionics, October 1964 to April 1975". Rodney Dale in the book "The Sinclair Story" says that the chip used was the GLS1802, however the GLS prefix is not a published Texas Instrument code of the period. Integrated circuit type not known, large LED digits, uses 4 button cells. Integrated circuit is Texas Instruments TMS1802NC, small LED digits manufactured by Bowmar with additional magnifying lens array, uses 4 button cells. Integrated circuit is Texas Instruments TMS0103NC, large LED digits manufactured by Texas Instruments, uses 3 button cells. Integrated circuit is Texas Instruments TMS0103NC, small LED digits manufactured by Bowmar with additional magnifying lens array, uses 4 button cells. Integrated circuit is GIM (General Instrument Microelectronics) C550, Bowmar small LED digits with lens array, uses 4 button cells. The Sinclair Executive was one of the smallest calculators of the time and certainly the thinnest. 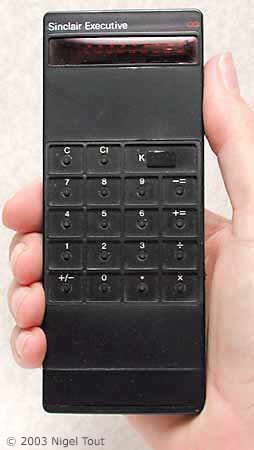 It was also the first in a long line of innovative Sinclair calculators. Clive Sinclair was already well known for his innovative, compact, and stylish electronics. This calculator demonstrated his flair with an incredible calculator design for this time. 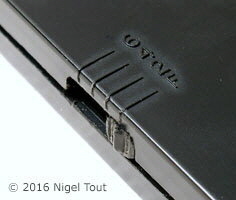 Side view, showing how thin the Sinclair Executive models are. The power switch is the small slider towards the right. For its time it was a very small calculator. With battery cover removed, showing the button cells. The type 1 casing has a decimal point switch along the side with the decimal point settings — 6, 4, 2, F — on the rear casing. The instructions recommend leaving it set to F (ie. Floating-point) unless specifically required otherwise. The calculators with the type 2 casing do not have this switch and are permanently set to use floating-point. An advertisement for the Sinclair Executive, emphasising how slim it is. 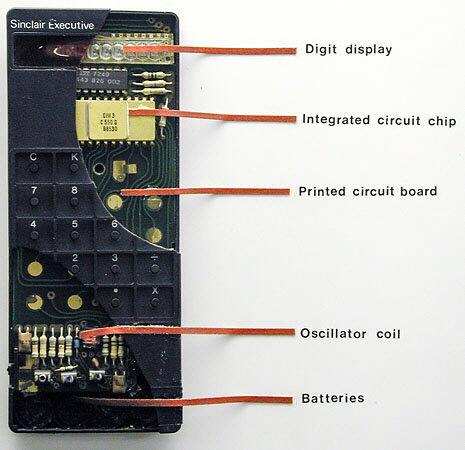 It also explains "The secret of the Sinclair Executive: The Executive's "brain" is an electronic marvel – a 7,000-transistor integrated circuit (the largest ever produced for commercial use)"
For this period in the development of electronic calculators the Sinclair Executive was incredibly thin, attained by using very innovative techniques. For instance, to reduce thickness conventional keyboard switches are not used but thin metal shim fingers which are pressed by tiny buttons onto the circuit board. Also, the power switch, on the side, presses spring contacts onto the circuit board and the decimal point selection switch slides contacts across the circuit board tracks. Inevitably, shortcomings with some of the the innovations employed led to the need for modifications and so the design of the Executive evolved. Sinclair appear to have used the designations MkI, MkII, and MkIII for some versions. Unfortunately, the two halves of the casing of the Executive are glued together and so it is not possible to easily see the electronics inside without damaging the calculator. Below is believed to be the story of the evolution of the Sinclair Executive. Please get in touch if you can provide further information or correct any mistakes. Casing and keyboard type 1, TMS1802NC chip, large LED display, 3 button cells - Integrated circuit is Texas Instruments TMS1802, large LED display manufactured by Texas Instruments, 3 button cells. This may have been designated Sinclair Executive MkI. The low power consumption needed to employ button cells with their small electrical capacity was initially attained by pulsing the "calculator-on-a-chip" integrated circuit - not recommended by the manufacturer, but it worked. "Just as the price war in electronic calculators was reaching its peak, a Huntingdon hi-fi maker has stepped in with a smaller rather than cheaper unit. 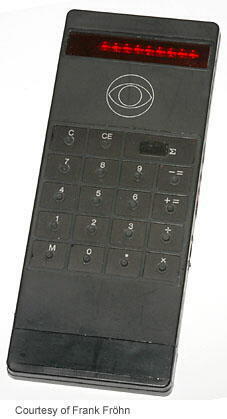 Sinclair Radionics Ltd has produced the first calculator that can comfortably fit in the user's pocket along with his wallet and cheque book. Sinclair's Executive is only 3/8in thick, smaller than a pound note, and weighs 2.5 oz, which makes it less than one third the weight and volume of the Rapid Data Rapidman 800. The Executive also has additional functions, including squares, reciprocals, and multiplication or division by a fixed constant. At �79 [Sterling], the Executive is twice the price of the Rapidman 800. But Clive Sinclair argues that the "executive toy" market is not particularly price sensitive; the firm has ordered components for 100,000 calculators. Sinclair's "Executive" uses a single metal oxide semiconductor (MOS) chip containing 7000 transistors. This type of integrated circuit normally consumes 350 milliwatts of power, provided by a fairly bulky rechargeable battery. Sinclair's miniaturisation trick depends on a special circuit which reduces the power requirement to about 20 milliwatts. This is accomplished by the elimination of all resistors from the circuitry and with a clock that turns off the power most of the time. Three small deaf-aid mercury cells provide 20 hours of life - over four months normal usage. Power is turned on only in 1.7 microsecond pulses, a figure determined by the storage time of a control transistor. The unit has an oscillator clock which operates at 200 kilohertz during calculations and drops to 15 kilohertz between each operation. Thus shut off time ranges from 3.3 microseconds during calculations to over 65 microseconds between. The device relies on the capacitance of the chips to store information during the shut off times, and 1.7 microseconds is long enough for the chip to carry out a single change of state of the electronics. Any calculation can be done in 1000 such changes." Engineers at Texas Instruments Ltd. say they've not tested 1802 chips in the particular way that Sinclair is using them, but the only snag they can foresee is that some chips might need more power than Sinclair is giving them to work properly. To guard against this, Sinclair is checking each chip for its working power threshold before use. Since he offers a five-year guarantee on a machine priced at $205 in Britain, he obviously has no qualms. The seven-segment gallium-arsenide-phosphide display is driven directly from the batteries and the chip, an approach which avoids the need for buffer amplifiers between chip and display." A brief review in the journal "Wireless World" in August 1972 was somewhat critical and did not like the crude on/off and decimal-place switches, the keyboard, and the way that the electronics was pulsed. In a letter to the journal published in the September issue, Clive Sinclair rebutted the complaints. However, Richard Torrens, who was service manager at Sinclair at this time, reports that soon after the release of the Sinclair Executive there were a large number of returns due to problems with the battery contacts, the on-off switch and the keyboard—much as the review in Wireless World had criticised. Richard says that he does not recall that there were problems with the battery switching—but the Sinclair Executive was soon redesigned and the redesign did not include the battery power switching feature, which then resulted in criticism of the short battery life. On the left is an advertising brochure for the Sinclair Executive showing casing & keyboard type 1 and the large, centralised display of the early version (see circuit board below). For comparison, on the right is a Sinclair Executive also with casing & keyboard type 1 but with the small LEDs with the lens array, positioned towards the right, of later version electronics (see circuit board below). Casing & keyboard type 1, unknown chip, large LED display, 4 button cells - Unknown integrated circuit type, large LED display, 4 button cells. This version has the large LED numbers in the display, but the number of button cells has been increased from three to four. The example in the photographs below has serial number 21550. Sinclair Executive with casing & keyboard type 1 and display with large LED digits. On the left of the display is a single LED digit to indicate "Overflow". Close up of the display showing the locations of the LED digits which are in two groups of four symmetrically about the centre line, with a separate single LED digit at far left for indicating "Overflow". Compare with the version with the display with magnifiers, shown below. Casing & keyboard type 1, TMS1802NC chip, small LED display, 4 button cells - Integrated circuit is Texas Instruments TMS1802, small LED display manufactured by Bowmar, 4 button cells. To improve the battery life the large LED display was replaced by a Bowmar LED display with smaller characters but with an array of plastic magnifying lenses in front to increase the perceived size, but which also reduced the viewing angle. The number of button cells was also increased from three to four. This version appears to have been designated Sinclair Executive MkII, and appears to have had a long production run. The example shown opened below has serial number 369396. The two SN75492N LED display driver chips are date coded 1972 week 23, so the calculator could not have been manufactured before that date, unless both of these chips had been replaced and a new casing used. Close up of the display showing the bubble magnifiers in front of the nine LED digits of the display, which is displaced towards the right. Compare with the version with the display with larger LED digits and without magnifiers, shown above. Sinclair Executive with casing & keyboard type 1 and display with small LED digits with magnifying lenses. The front side of the circuit board showing the Texas Instruments TMS1802NC "calculator-on-a-chip", here date coded 1971 week 37. However, the calculator would have been manufactured much later than this, some time after 1972 week 23 printed on the two smaller SN75492N LED display driver chips. The rear of the circuit board, with the manufacturer "Bowmar" printed on the rear of the LED display. Casing & keyboard type 1, TMS0103NC chip, large display, 3 button cells - Integrated circuit replaced by the Texas Instruments TMS0103, large LED display manufactured by Texas Instruments, 3 button cells. Note that this may have been an experimantal prototype version since it was obtained incomplete and with a clear plastic casing. The TMS1802 chip was quickly renumbered TMS0102 and became the first member of the TMS01xx calculator-on-chip family of devices - See the article "The Arrival of the 'Calculator-on-a-Chip'". From this family Texas Instruments listed their "preferred types" which did not include the TMS0102 but did include the TMS0103 with the description "The TMS0103 provides eight digits, four operations, floating or fixed decimal point, constant or chain operation, automatic roundoff, overflow and underflow, leading zero suppression, and automatic power-up clear. This variation uses the arithmetic keyboard entry system, the same as standard business machines". The TMS0103 is used in this version of the Sinclair Executive, while retaining the large LED display and having space for just three button cells for the power supply. Large LED display across the whole width of the board. Has driver transistors above and below. TMS0103NC chip (here date coded 1972, week 5). Gold-plated contacts on the circuit board for the key switches. Cut-out for three button cells. Sinclair Executive circuit board fitted with a special transparent top cover which allows a view of the components inside. The key switch spring contacts have also been fitted. Each switch would be operated by a rubber push button located in the hole above it in the top cover. With this rather crude arrangement the thickness of the keyboard was minimised. Casing & keyboard type 1, TMS0103NC chip, small display, 4 button cells - Integrated circuit is Texas Instruments TMS0103NC, LED display replaced by one manufactured by Bowmar with small LEDs and a magnifying lens array, 4 button cells. The example shown in the photographs below has serial number 26646. The TMS0103NC chip chip is date coded 1973 week 7, so the calculator could not have been manufactured before that date, unless the chip had been replaced and a new casing used. Small LED display with array of lenses, mounted towards the right side of the circuit board. Has two SN75492N LED display digit driver chips below. TMS0103NC chip (here date coded 1973, week 7). Contacts for four button cells. Casing & keyboard type 2, chip GIM C550, small display, 4 button cells - Integrated circuit is GIM (General Instrument Microelectronics) C550, display manufactured by Bowmar with small LEDs and magnifying lens array, 4 button cells. This appears to have been designated the Sinclair Executive MkIII. The cut-away casing type 2 Sinclair Executive on display at the Science Museum in London, shown in the photograph below, uses a integrated circuit from a different manufacturer, the GIM (General Instrument Microelectronics) C550, rather than the Texas Instruments chips used in the casing type 1 models described above. This casing type 2 model is known in two versions - with the high/low brightness switch the opposite way round, as shown in the photographs below. This version, too, appears to have had a long production run. Sinclair Executive with casing & keyboard type 2 and "L"/"H" (Low/High) display brightness switch. Sinclair Executive with casing & keyboard type 2 and "H"/"L" (High/Low) display brightness switch. A Sinclair Executive with casing & keyboard type 2, electronics version 5, cut to show inside. Photographed at the Science Museum, London. The LED display with an array of lenses. Space for four button cells. In December 1973 the British consumer journal "Which" tested a selection of small calculators, unusually including two types of Sinclair Executive calculator; both a case 1 type (which it refers as the MkII) and a case 2 type (which it refers as the MkIII). During their tests both their "Sinclair Executives (MkII and MkIII) broke down; further samples proved satisfactory." Sinclair was renowned for its "no-quibble" replacement policy if there were problems with its products, though problems were not uncommon but it did give a 5 year guarantee. The Sinclair Executive was found to have "the narrowest viewing angle (only 20 degrees) of the models tested, and was the one our users found most difficult to read. It was also the only one you had to hold straight in front of you — a further restriction. It's clear that designing the Sinclair to be slim enough to fit unnoticed into a breast pocket has caused problems in other respects." A narrow viewing angle is a property of the lenses used in front of the LED characters to magnify the small LEDs, which are used in order to reduce power consumption. This is a feature of a lot of LED calculators of the time which use these lenses. Their tests gave a battery life of 4� hours for the MkII (case 1 type) and 9� hours for the MkIII (case 2 type). "Nine months ago, I bought a Sinclair Executive and have carried it everywhere. Being just ⅜ in thick and weighing only 2� oz, it is not only the smallest electronic calculator in the world but also the only true pocket-sized machine. I am now on my third model, the first two being thoroughly unreliable. Sinclair, fortunately, gives a five year guarantee. The chip on the latest model appears to have been replaced by a General Instrument design which allows full flow arithmetic. The display has also been changed, for the worse, and the two, four and six decimal switch has been ditched. So, alas, has the invaluable last entry clear key. Admittedly the price has come down from �79 to �59. Good value? Well hardly.... But then it's not so much a professional calculator but more a piece of personal jewellery. And as such it continues to delight and amaze people"
Similar to the Sinclair Executive above, but also has a memory. 5.4v (4x mercury button cells). Main integrated circuit: TI TMS0132NC. Is found in at least three styles of casing, as shown above. Side view showing how thin this machine is. TMS0132NC chip (here date coded 1973, week 40). 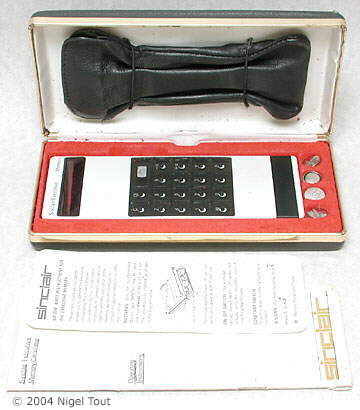 Sinclair Executive Memory in presentation case, with soft pouch and instructions. Frank Fr�hn has kindly provided this photograph of an all-black Executive Memory. The only marking on it is the logo, which appears to be that of CBS (Columbia Broadcasting System), so it was probably supplied as a promotional item. Click here for more Sinclair calculators on the associated Vintage British calculators site. Also see the article Clive Sinclair and the pocket calculator in the Collecting Calculators section of this site. "Pocket calculator weighs in at 2.5 ounces", Electronics, July 3 1972, p3E. "Chris Curry talks about Clive Sinclair, Sinclair Radionics and Acorn Computers", The Centre for Computing History, Youtube, https://www.youtube.com/watch?v=KrTmvqwpZF8. "Sinclair Radionics, October 1964 to April 1975", Richard Torrens, http://electronics.torrens.org/Sinclair/inside/Enderbys.php#exec. Dale, R., (1985), "The Sinclair Story", London, Duckworth, ISBN 0 7156 1901 2. (1971), "Texas Instruments Semiconductor Components Data Book Six: MOS/LSI & Hybrid", Texas Instruments. "Pocket calculators add up to a big market", New Scientist, July 20 1972, p144. "News of the month: Small pocket calculator", Wireless World, August 1972, p364. "Small electronic calculators", Which?, December 1973, pp369-374. "Shopping around for a calculator", Nicholas Val�ry, New Scientist, 31 May 1973, p551.